Nutcracker with Gift Guest Towel. Holiday hand towel. Size: 14 x 22 inches. Embroidered, 55% Linen 45% Cotton. Peking Handicraft Inc. Handcrafted quality handcrafted linens for the home, home fashions, holiday celebrations, entertaining and more. 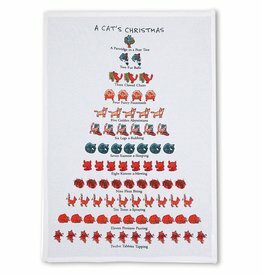 A Cat's Christmas 12 Days of Christmast Holiday Flour Sack Kitchen Towel. Size: 18 x 26 inches. 100% Cotton. Peking Handicraft Inc. Handcrafted quality handcrafted linens for the home, home fashions, holiday celebrations, entertaining and more. Eat Drink Be Merry Cocktail Napkin-White. Size: 6 inch square. 55% Linen, 45% Cotton. Peking Handicraft Inc. Handcrafted quality handcrafted linens for the home, home fashions, holiday celebrations, entertaining and more. Size: 16x25 inches. Red Ribbion Christmas Towels. Peking Handicraft Inc. Handcrafted quality handcrafted linens for the home, home fashions, holiday celebrations, entertaining and more. A California Christmas Holiday Flour Sack Kitchen Towel. Size: 18 x 26 inches. 100% Cotton. Peking Handicraft Inc. Handcrafted quality handcrafted linens for the home, home fashions, holiday celebrations, entertaining and more. Size: 14x22nches. Happy Holidays Towels. Peking Handicraft Inc. Handcrafted quality handcrafted linens for the home, home fashions, holiday celebrations, entertaining and more. Seashell Wreath Guest Towel. Holiday hand towel. Size: 14 x 22 inches. Embroidered, 55% Linen 45% Cotton. Peking Handicraft Inc. Handcrafted quality handcrafted linens for the home, home fashions, holiday celebrations, entertaining and more. 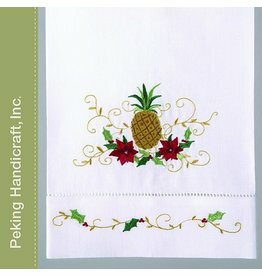 Christmas Pineapple Guest Towel. 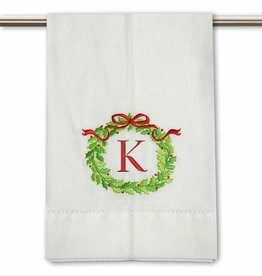 Holiday hand towel. Size: 14 x 22 inches. Embroidered, 55% Linen 45% Cotton. Peking Handicraft Inc. Handcrafted quality handcrafted linens for the home, home fashions, holiday celebrations, entertaining and more. Ornament Linen Cocktail Napkin. Artist. Glitterville. Size: 6 inch square. Peking Handicraft Inc. Handcrafted quality handcrafted linens for the home, home fashions, holiday celebrations, entertaining and more. Christmas Hapy Holiday & Strips Towels Size: 18x26 inches each. Cordinating Set. Peking Handicraft Inc. Handcrafted quality handcrafted linens for the home, home fashions, holiday celebrations, entertaining and more. A Movie Lover's Christmas Holiday Flour Sack Kitchen Towel. Size: 18 x 26 inches. 100% Cotton. Peking Handicraft Inc. Handcrafted quality handcrafted linens for the home. Artist: David Price. 12 Days of Christmas Towels. 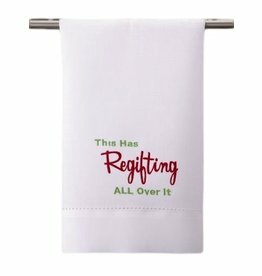 Quote Reads - This has regifting all over it- Guest Towel. Size: 14 x 22 inches. 55% Linen, 45% Cotton. Peking Handicraft Inc. Handcrafted quality handcrafted linens for the home, home fashions, holiday celebrations, entertaining and more. Size: 18x26 inches. 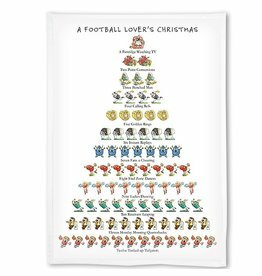 A Football Lover's Christmas Kitchen Towel. 100% Cotton. Peking Handicraft Inc. Handcrafted quality handcrafted linens for the home, home fashions, holiday celebrations, entertaining and more. David Price 12 Days of Christmas Towels. A Wine Lover's Christmas Holiday Flour Sack Kitchen Towel. Size: 18 x 26 inches. 100% Cotton. Peking Handicraft Inc. Handcrafted quality handcrafted linens for the home, home fashions, holiday celebrations, entertaining and more. Size: 26x34 inches. Holiday Christmas apron. 100% Cotton. Peking Handicraft Inc. Handcrafted quality handcrafted linens for the home, home fashions, holiday celebrations, entertaining and more. Christmas Patch Kitchen Towels Size: 18x26 inches each. Cordinating Set. Peking Handicraft Inc. Handcrafted quality handcrafted linens for the home, home fashions, holiday celebrations, entertaining and more.